Story Arc: As we are writing, we need to think about how stories go. Think of stories as following a certain pattern. While all stories are a little different, they usually follow what we refer to as a NARRATIVE ARC. As you can see, Stories often start by introducing the CHARACTERS and the SETTING. Then the author tells us about the HOPES or DESIRES of the character. BUT, there will be an obstacle or CONFLICT in the character's way of reaching his or her wishes. SO, now we have a story! Usually the conflict will build with 2 or 3 events. Sometimes we call this RISING ACTION. The CLIMAX is the most exciting and tense part of the story. Once the character has faced his or her obstacle in the CLIMAX, the story is almost over. The end is called the RESOLUTION. When we write to inform, we have to be sure we've done good research. Good research means we use reliable, accurate resources. We started with books. We've talked about using Text Features to help negotiate our Non-fiction books. We also can use informational websites. 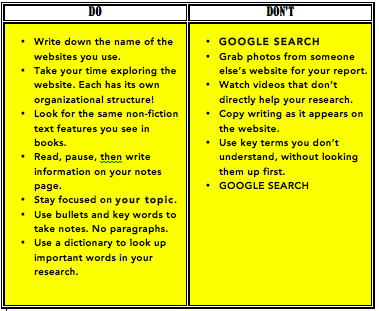 Here are some Do's and Don'ts to guide your research online. ​Here are some approved animal websites. Is the skin rough, smooth, furry? Does the animal shed its skin or molt? What shape eyes? What shape pupils? Where are the eyes on the head? How well does the animal see? Can the animal swim? Fly? Do both? Stand upright or walk on all fours? Where does your animal live? (continent, country, region, state) Most common? Does the animal migrate? Where to where and when? What kind of climate does your animal need? What landforms does your animal live in/on? Mountains, gulf, freshwater, mangroves, plains, forests, jungles? Is it a carnivore, herbivore, or omnivore? Hunt alone or in a group? How are the babies born? Hatched, born live? Stages like a frog or butterfly? Molting? Who lives together in the “family”? 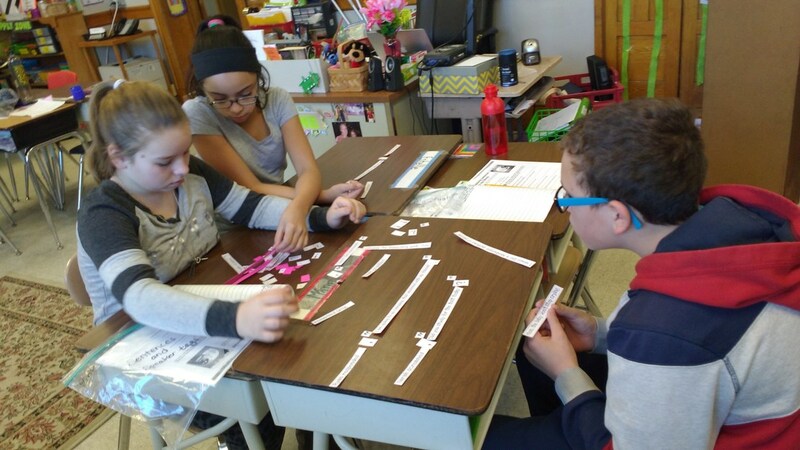 What role does each animal play in a group? If only 1 parent stays with the babies,where does the other parent go? How long do the babies stay with their parents? How long does it take for babies to become adults? 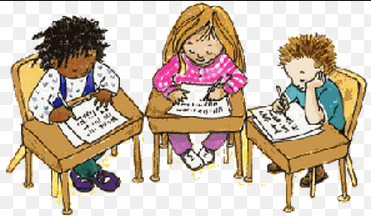 You will be using 2 printed articles from the classroom for your primary research on your chosen topic. Are competitive sports good for kids?